In 2016 – 2017, FOLK New England’s “Stories Through Song” supported by the “ASCAP Foundation in honor of Joan Baez 2016” continued to introduce hundreds of students to folk music as a way of learning about their past and telling their own stories in song. With ASCAP Foundation support, hundreds of elementary school students in Cambridge and Lincoln, MA participated in an exploration of “Stories Through Song” with guest artists Marylou Ferrante and Alastair Moock. Alastair Moock focused on the folk music of America with a “Playing with Tradition” theme and Marylou Ferrante focused on the folk music of Cambridge, MA. Both emphasized the music of Joan Baez, engaged the students, and integrated student performance into the sessions. Again this year, all of the participating elementary school classes were introduced to Joan Baez and the songs she shared with her audiences. 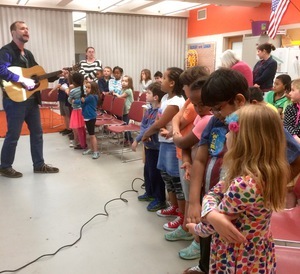 In addition to the classroom programs, FOLK New England took the “Stories Through Song” program into the wider community and reached an estimated 600 children and adults. Alastair Moock presented the program at three public libraries and a museum. The band Cold Chocolate performed a free children’s performance at the HUBBUB Festival in Boston’s Copley Square emphasizing the legacy and songs of Joan Baez. The program hosted 9 class sessions in Cambridge & Lincoln, MA plus 5 open programs in public libraries (Arlington, Hamilton, and Norfolk), the Institute of Contemporary Art (Boston), and Hubbub, an outdoor festival in Copley Square. Focusing on the Folk Revival and Joan Baez’ legacy, Marylou Ferrante hosted 3 sessions on the importance of folk music in Cambridge for 50 3rd graders at Graham & Parks School. Her students will continue their exploration next year with Alastair Moock. Mr. Moock‘s “Playing with Tradition: Voices of American Folk” highlights the history of folk music. With slides and audience participation, he reveals the impact of folk music in America. Moock worked with 82 Haggerty School 1st and 2nd graders, 30 students at The Birches, 3 public libraries (one with 250 children & adults), and an audience of 200 at the Institute of Contemporary Art. Local band, Cold Chocolate, performed a concert on the Children’s Stage at the HUBBUB Festival in Boston to an audience of 150. The performance featured folk music for kids and highlighted Joan Baez. All venues are located in Massachusetts.